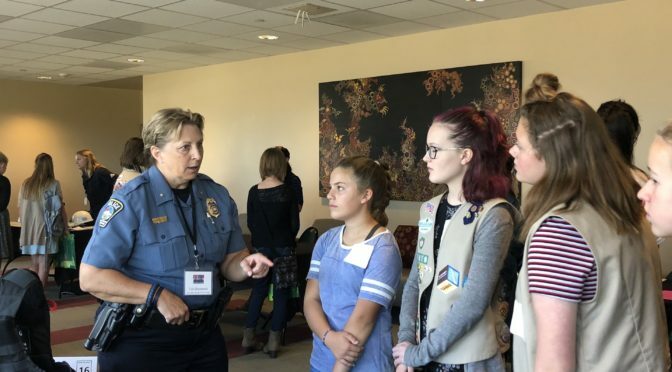 More than 75 girls in grades 6-12 from along the Front Range had the unique opportunity to connect with Colorado Springs area professional women in a speed-dating format, panel discussion, and networking lunch. Secrets to Success was held in the Pikes Peak region on Saturday, October 20, 2018 at the University of Colorado, Colorado Springs. Secrets to Success, presented by AT&T and powered by Girl Scouts of Colorado, introduced girls to more than 20 professional women! Breakout sessions went deeper into career options including skilled trades, education, STEM, public service, healthcare, and entrepreneurship. 2008 Olympic Weightlifter Carissa Gump gave the keynote speech. Special thanks to event sponsors: El Pomar Foundation, GE Johnson, Newmont Mining, Ent Credit Union, Garden of the Gods Collection, Nor’wood Development Group, Union Pacific Foundation, and the U.S. Olympic Committee. Olympian Carissa Gump, who competed in weightlifting in 2008, will be the keynote speaker for Secrets to Success in Colorado Springs on October 20, 2018. The event takes place at the University of Colorado in Colorado Springs. Carissa is currently the executive director of the U.S. Strength and Conditioning Foundation, and comes to strength-building from many angles: physically, mentally, and emotionally. Her story is about the kind of toughness it takes to compete at the Olympic level in a sport that has traditionally been reserved for men. She will speak about the kind of inspiration she received to pursue her dreams as an Olympian, and how this inspiration still serves her today. She is thrilled to share her story with the young women who will be attending the October 20 Secrets to Success event! Girl Scouts AND any girl in grades 6 through 12 are invited to participate in Secrets to Success on October 20. Every girl will get to meet and hear from more than 20 women who are experts in their fields and learn their “secrets to success.” It will be a great chance to network with Colorado Springs’ finest women and sample the variety of career options available to girls and young women today! Register at www.girlscoutsofcolorado.org/en/support-us/fundraising-events/secrets-to-success-pikes-peak.html and don’t forget to invite your friends!